Whew! I have officially survived my second full week back in Kindergarten! I am BEAT! I am excited, because I really have a pretty good class, overall. We've had a few incidents, of course, but nothing compared to last year! It helps that I have an amazing assistant and a Granny to help with these kids! Thank goodness!!! Over the past few weeks, we have been working on counting, sorting, classifying, graphing, and exploring. 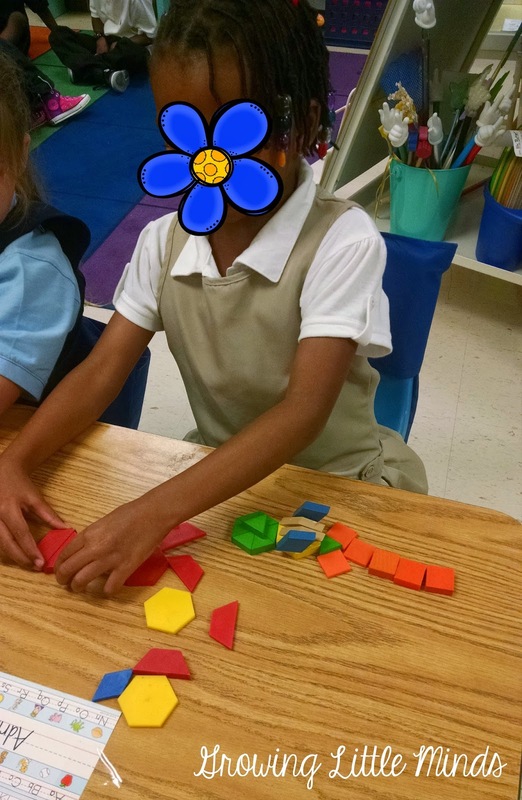 We spent a few days just getting used to the math manipulatives through exploration. 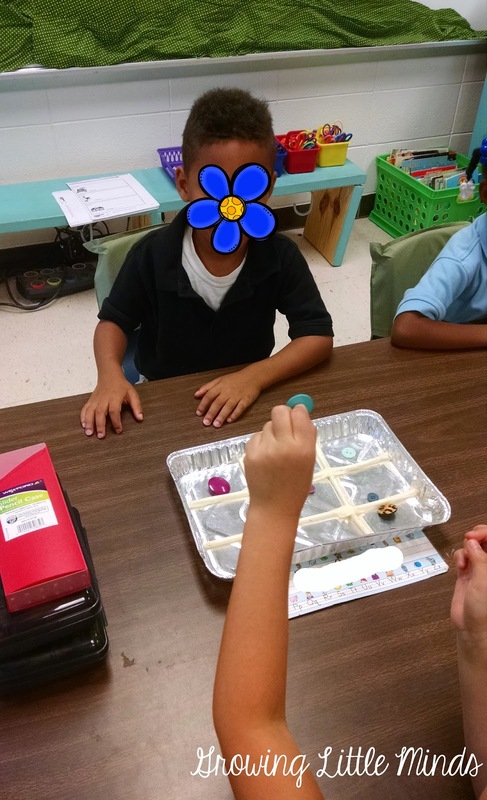 We taught the students how to appropriately get the manipulatives they needed, how to use them appropriately, and how to put them away. 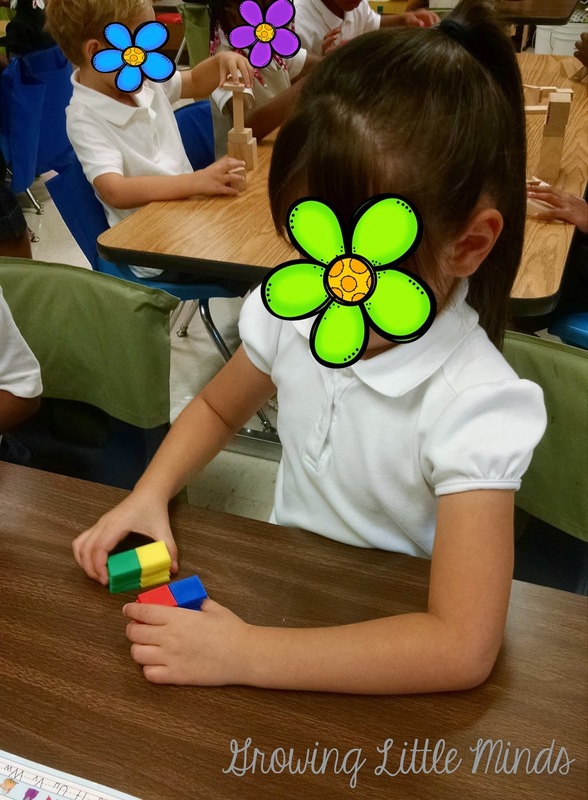 We talked about how the manipulatives were tools to use for math, not toys to play with. I think that is so important, because the students will start treating them as toys. 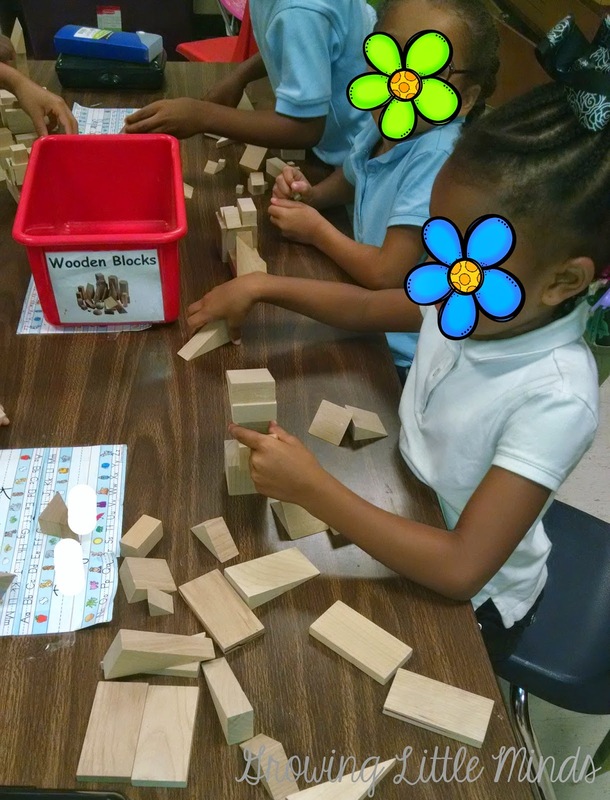 We have explored color tiles, connecting cubes, wooden blocks, attribute blocks, buttons, and pattern blocks. These are manipulatives we will be using a lot of throughout the school year, so it's useful to get them used to them now! I love giving them a little bit of time to explore. It's so interesting to see what they come up with! Some of them make things, while others experiment with patterns. Some sort and classify them. It's so fun to watch them work! We also did a lot of practice with counting and data collection. One way we practiced counting, understanding more or less, and collecting data is through graphing. 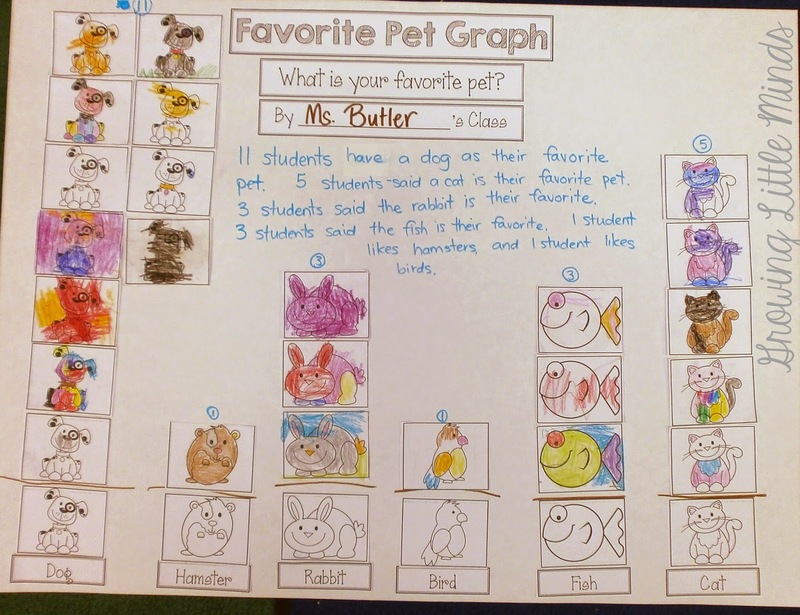 Throughout the first few weeks of Kindergarten, we do a ton of graphs! They help us get to know our students better and also gives them many opportunities for learning. 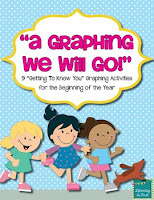 The graphs I used throughout the first few weeks of school came from my "A Graphing We Will Go!" 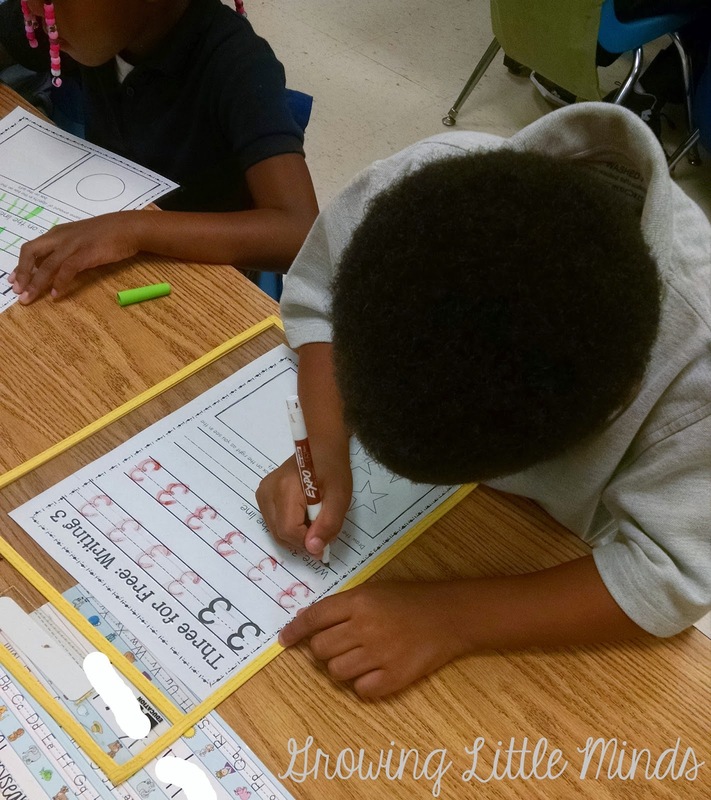 bundle of Back to School graphing activities. There are several different graphs that you can use with your students. We just used a few of them. There are several more that we will probably do over the next few weeks. 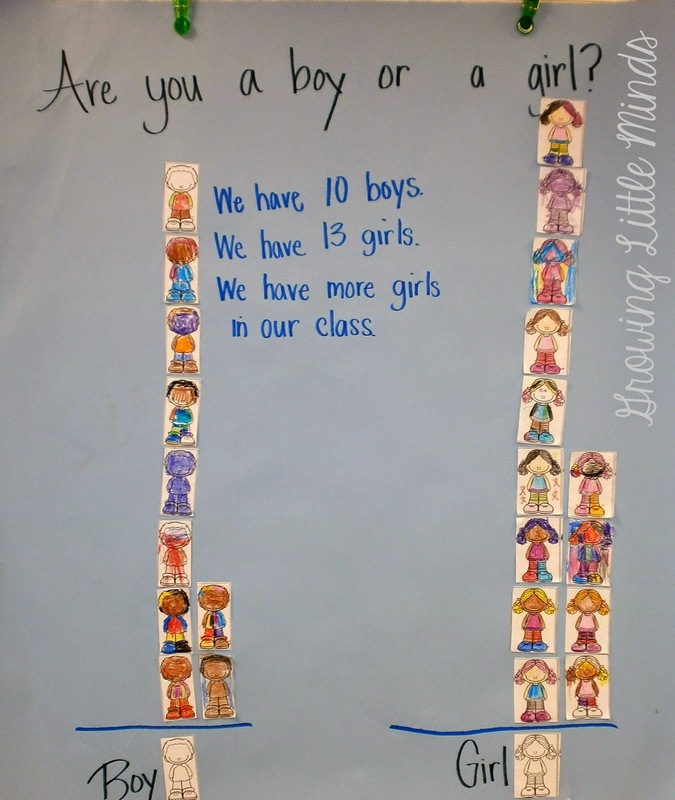 The first graph we made was "Are you a boy or a girl?" This is a good graph to start with because there are only 2 options, and most students already know the answer! 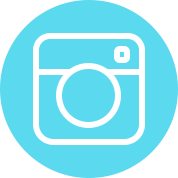 As we add more data to our graph, we recount the pictures we've already glued to the graph, compare to see which data point is greater, and make predictions on what the outcome will be. 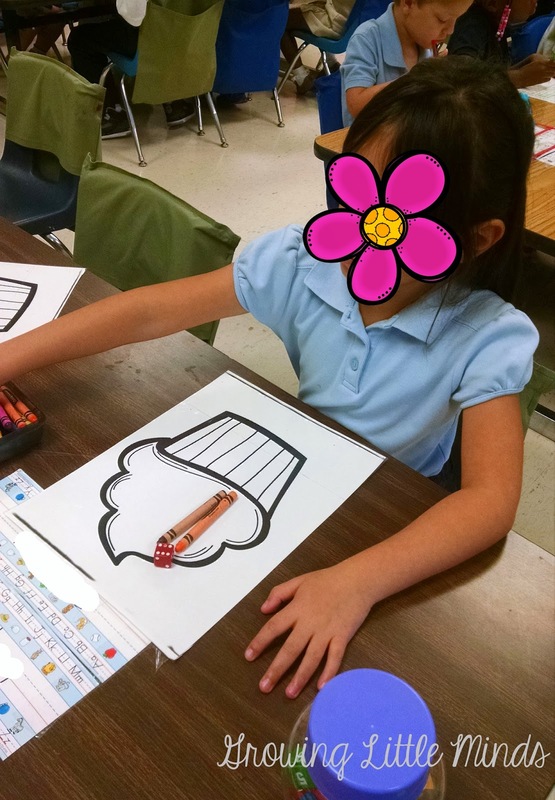 When we completed each graph, I let each child tell me what their choice answer was, and then I handed them that picture. 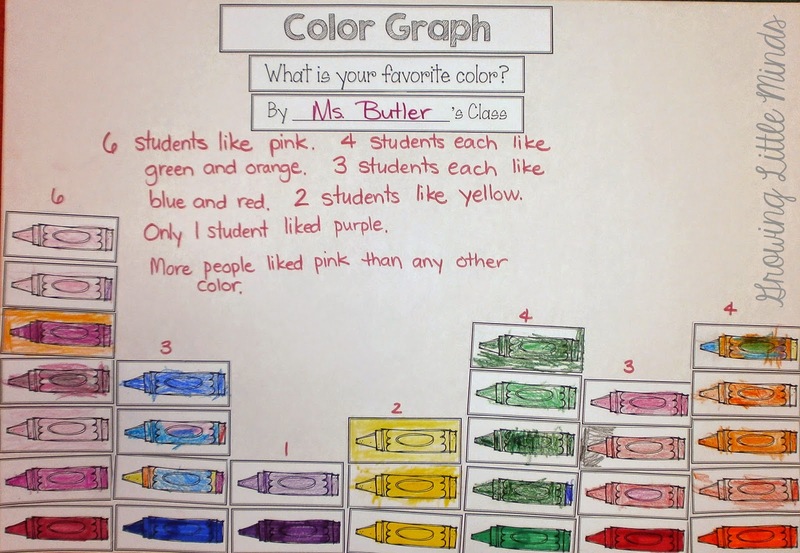 They went back to their seats to color them, and then we met again on the carpet to put the graph together. This was a great way to practice transitions as well! We also did graphs with more data points. 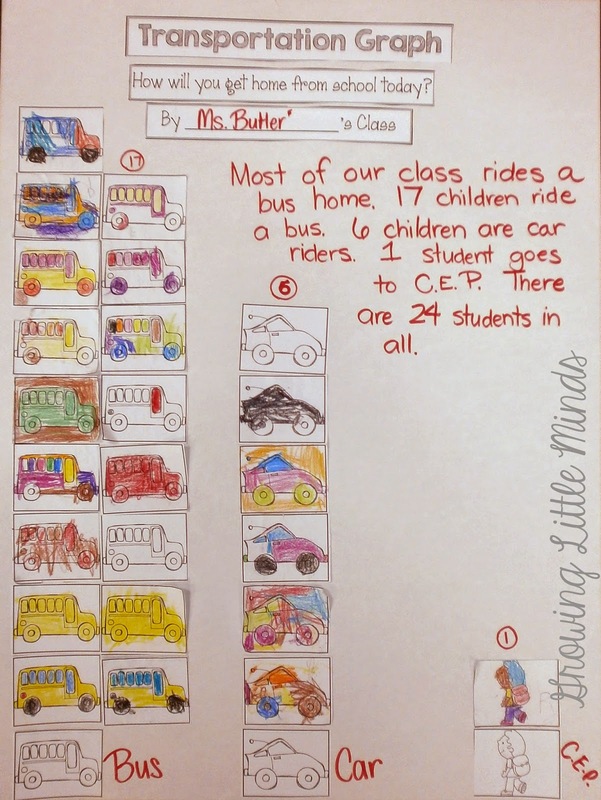 For example, we did the transportation graph the 4th day of school, once the chaos of the first few days ended! The students needed to be able to tell me how they were getting home from school. You could add their names in black marker to their picture, so you can use this graph to refer to throughout the year. It's also easy for you to check that they are giving you the correct answer, because hopefully you know how your students are getting home! I love to read "This is the Way We Go to School" with this graph- it's a great way to incorporate literacy into math! Another graph I love to do is "What is your Favorite Kind of Ice Cream?" I love this one because there is always ice cream involved! We do this graph, and then we bring ice cream for the students as a surprise. We usually do this one on a Friday. 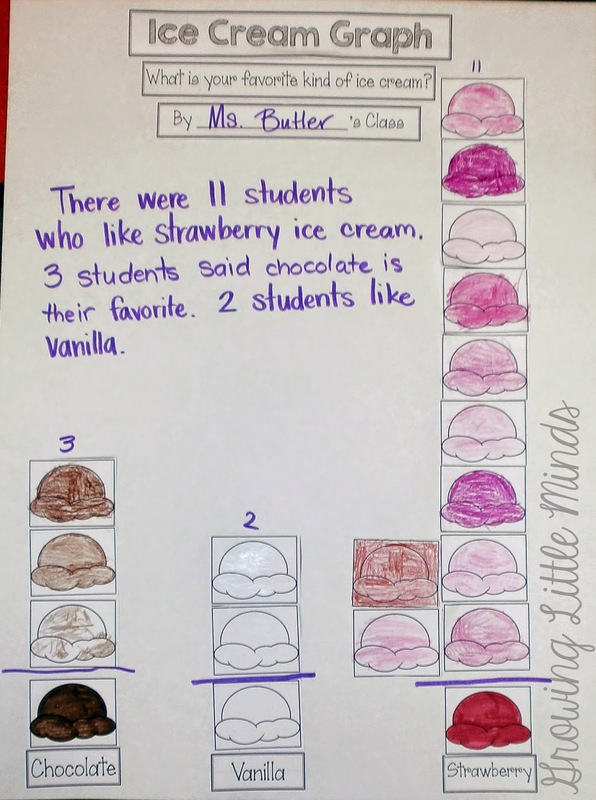 :-) I usually don't have more than half my class say strawberry is their favorite, though! This shocked me! 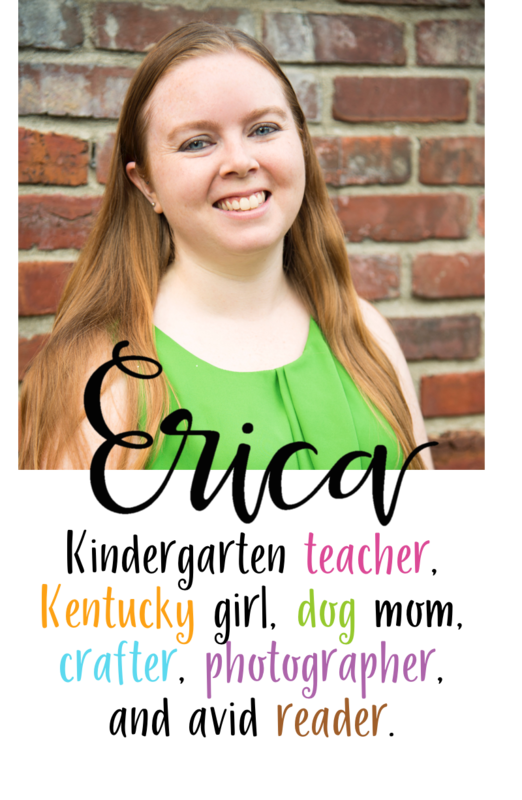 We also did "What is your Favorite Pet? 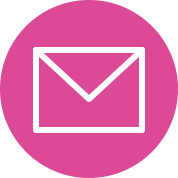 ", "How Many Letters are in Your Name? ", and "What is your Favorite Color?" 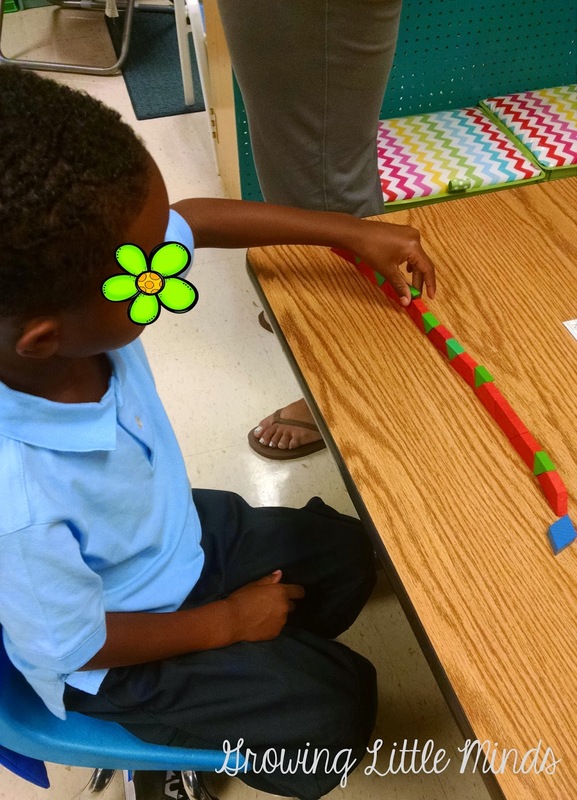 These graphs help you to see if your students can follow simple direction, and it also gives them practice with counting and comparing data. 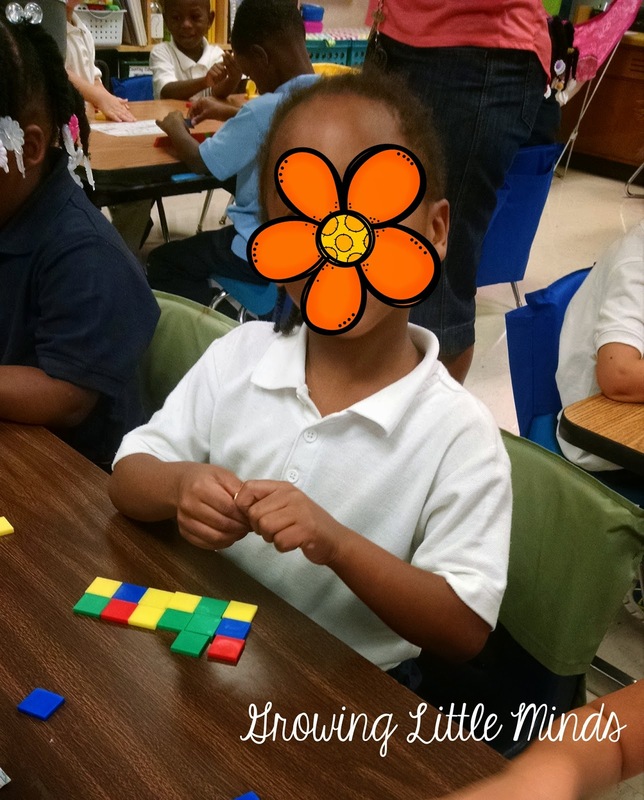 After we gave our students lots of practice with manipulatives, and finished our beginning of the year graphs, we started working on teaching our students about math workshops. 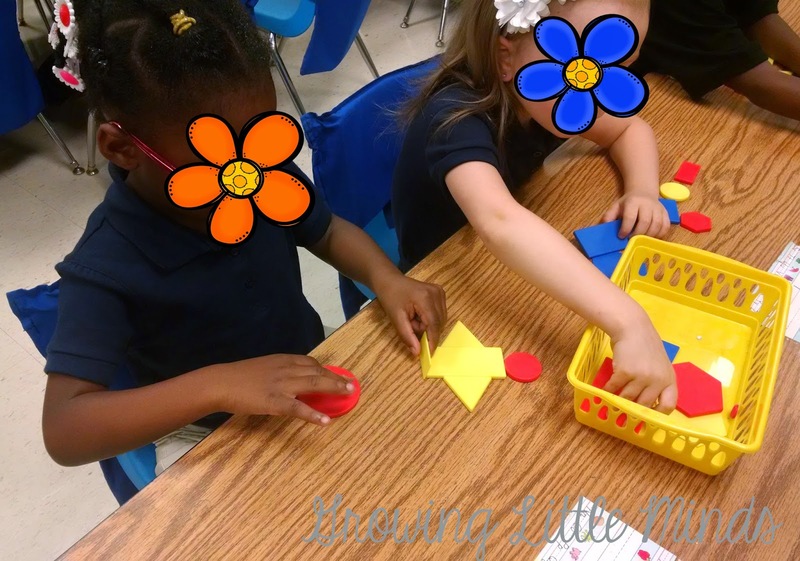 We like to use math workshops in Kindergarten. 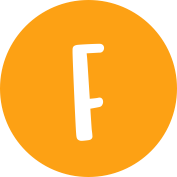 This allows the students to be working on multiple activities at once, while allowing us to differentiate activities. 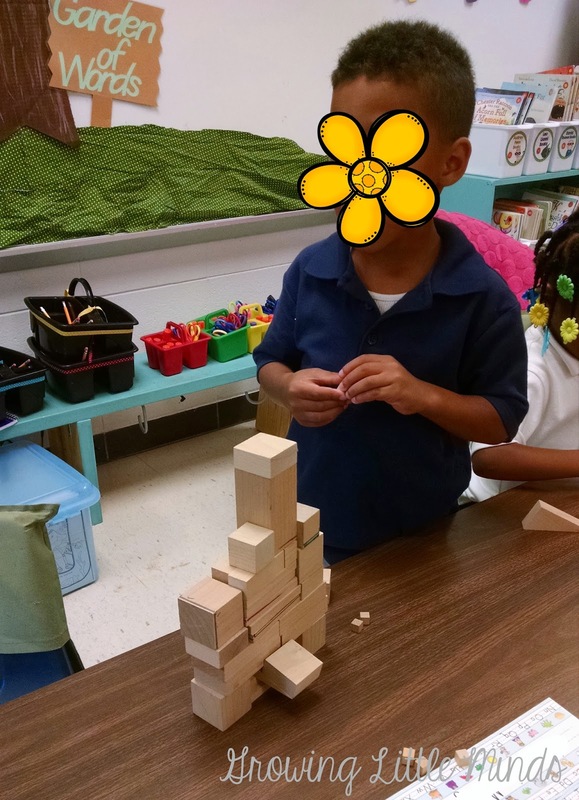 Students who are struggling with one skill can continue to practice that skill, while students who have mastered that skill can move on to another skill. 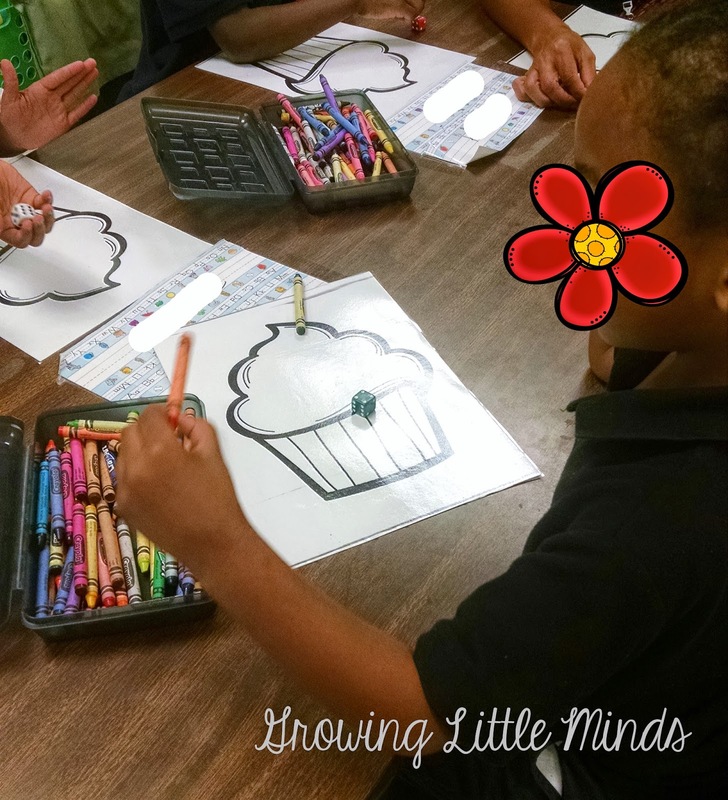 The teachers can work with small groups to enrich or intervene. I love centers! We did some practice with writing numbers. 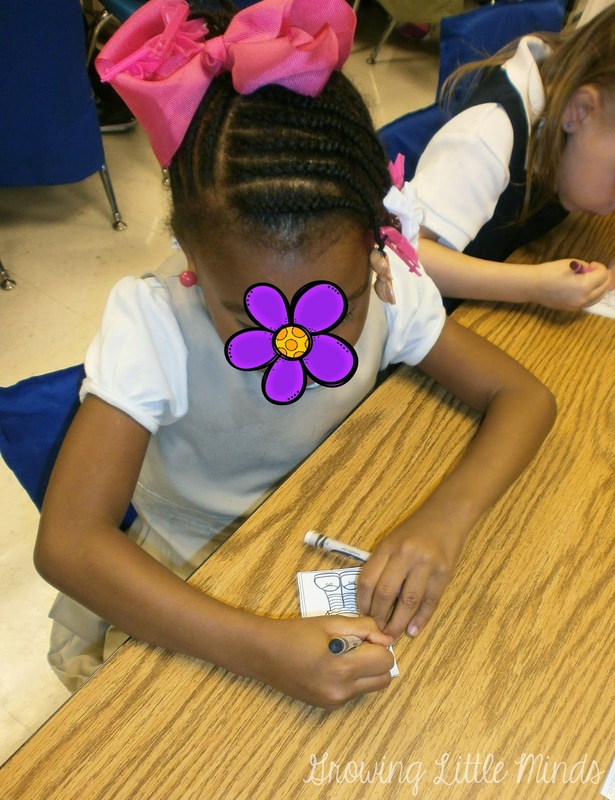 I have a few dry erase pockets, so we created a number writing sheet that allowed the students to get some practice tracing and writing numbers, while using the dry erase markers. Every teacher knows the students are excited about that! 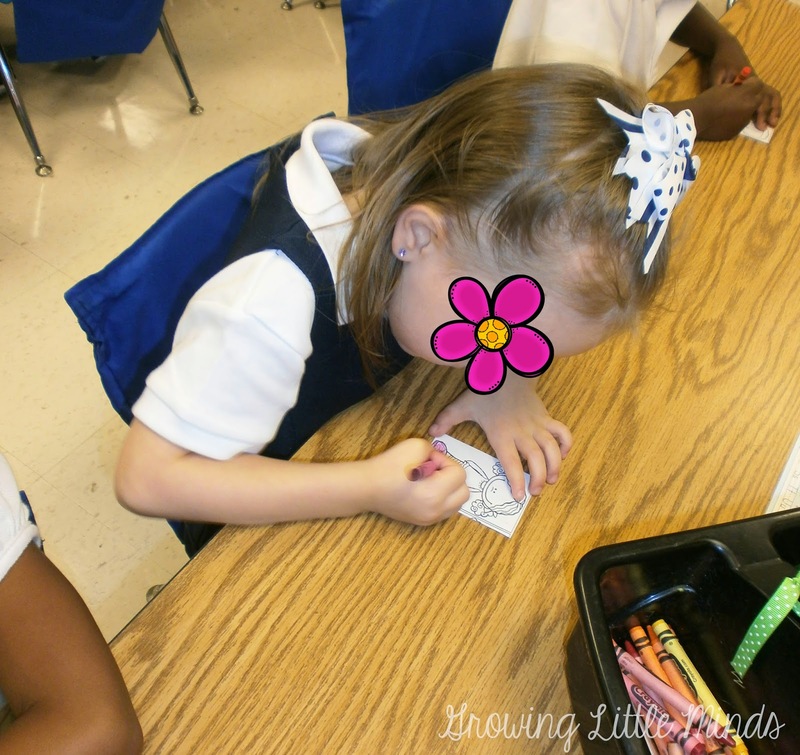 We also did this counting activity. 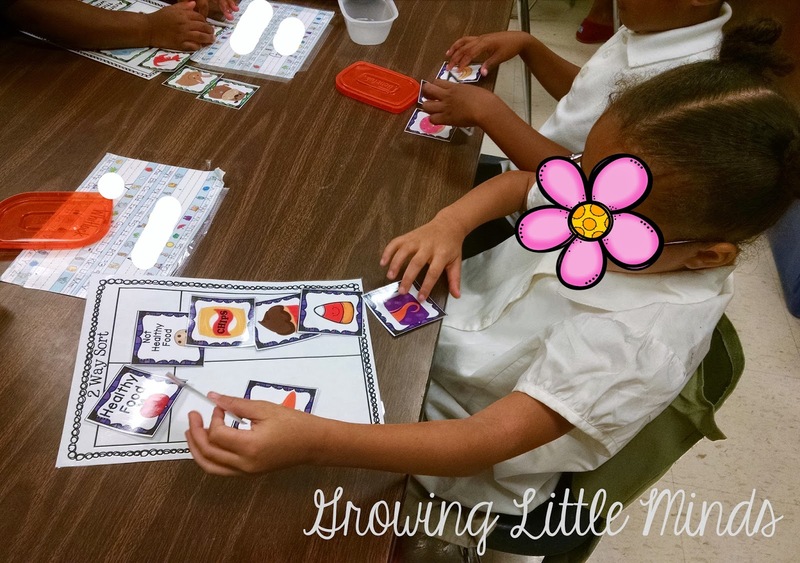 Each student had a die labeled 0-5, a birthday cake mat, and crayons. The students had to roll the dice and put that many crayons on the mat. Then they had to roll the dice again, and figure out how many candles they had to put on or take off of the mat. Some of the students did really well with it, while others really struggled. I also mentioned that we have been working on sorting. We played "Button Match Up" and "Attribute Block Match Up" as well. 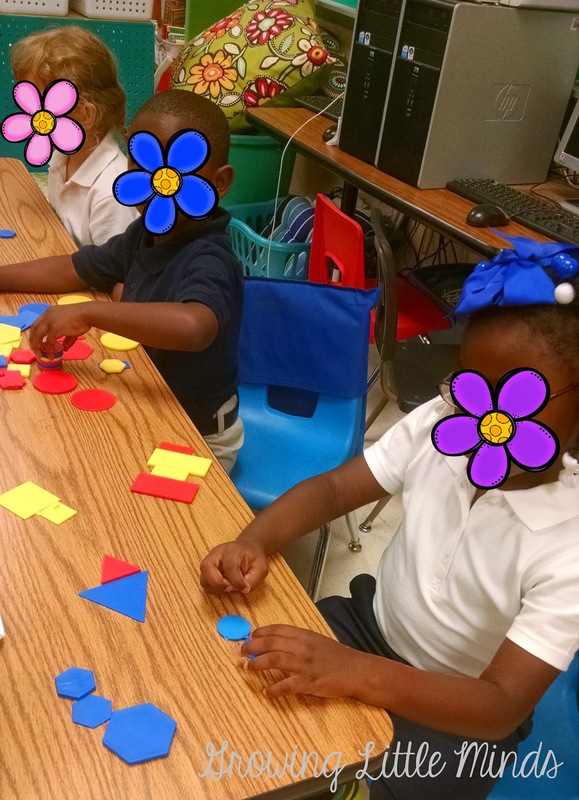 These two games are similar, as far as that the students need to sort the objects based on one similar attribute, such as color, shape, or size. The students really enjoyed these games. 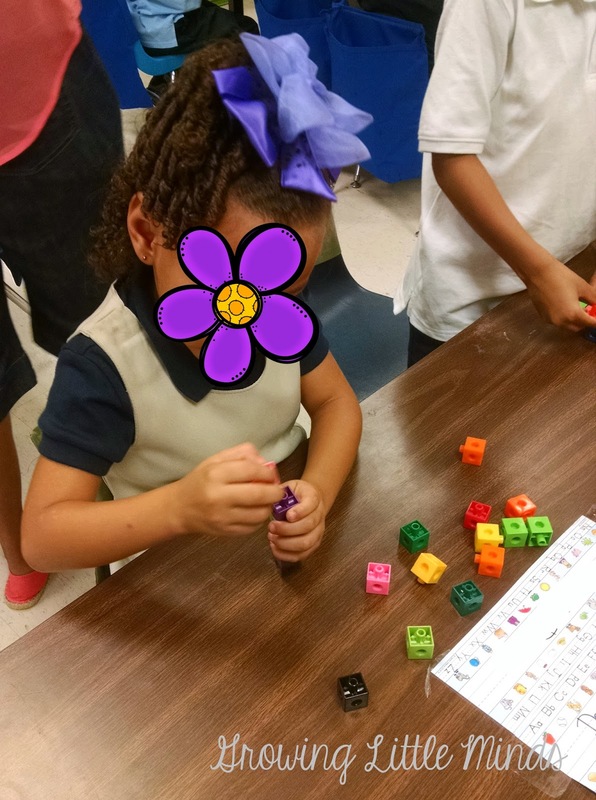 And since they were familiar with the manipulatives already, they were ready to get focused and play the games instead of playing with the manipulatives! 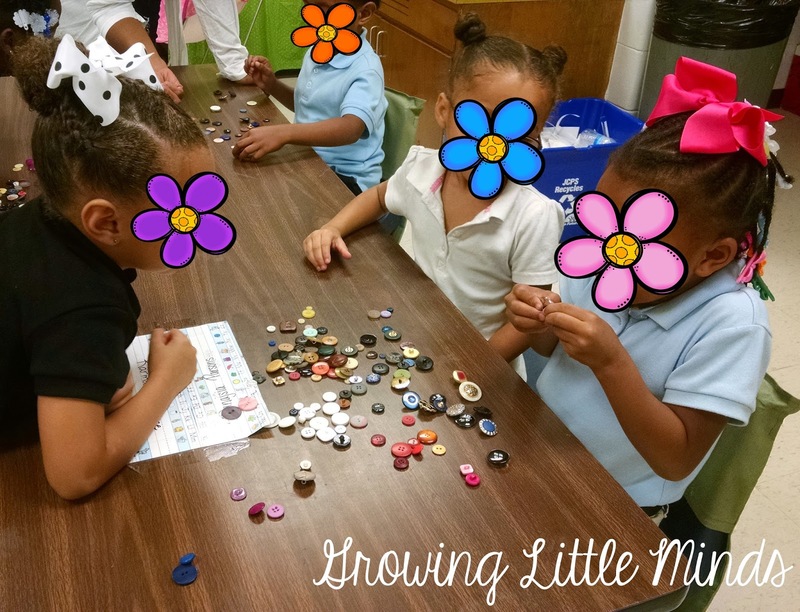 I love that all 3 of these girls are working together to sort their buttons. They worked so well together! We also did some concept sorting. 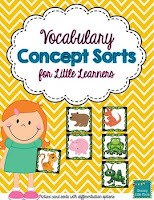 We used my Vocabulary Concept Sorts to help sort pictures into the correct category. The kids really enjoyed this, and it was easy to see which misconceptions they had as well. We also played a little game I like to call "What's Missing?" There are 9 squares on each tray, and 9 different objects on each tray. 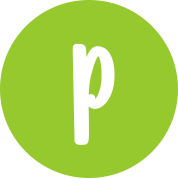 The students play in partners. 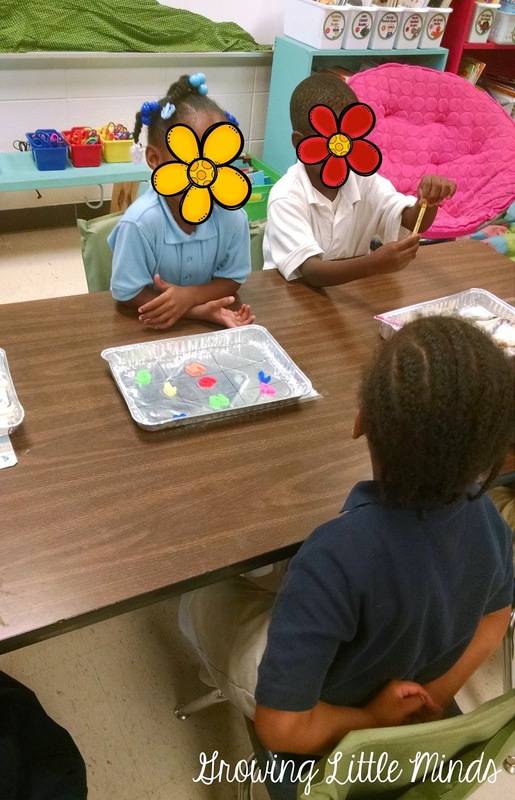 The first student covers their eyes, while the second one takes one of the objects off of the tray and hides it. The first student has to figure out which object is missing off of the tray. They get 3 guesses to figure out which object their partner is hiding. I love how one of my students is hiding the missing object behind his back. And here, one of my students is showing her partner which object she took off the tray. So that has been our math for the first week and a half or so! 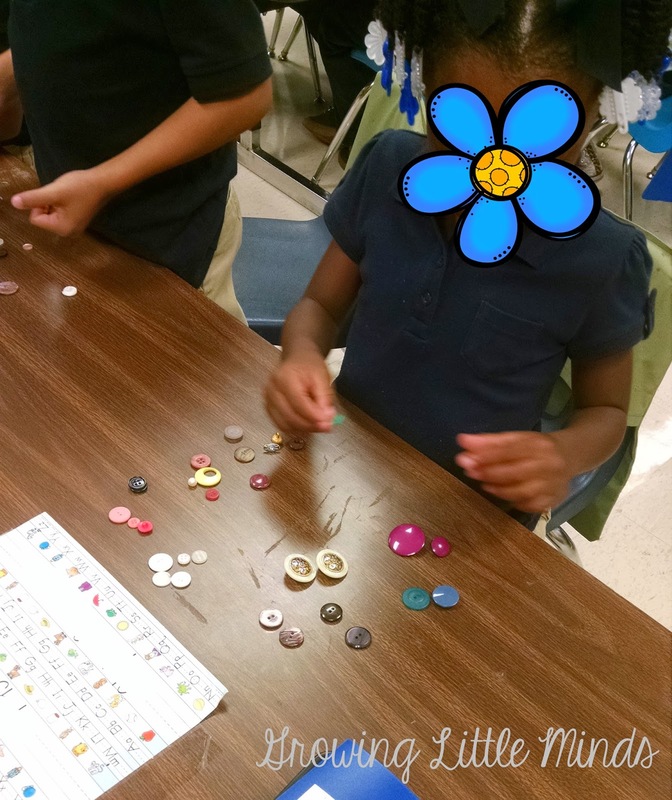 So far, my kiddos are loving learning about numbers and sorting objects! You can find some of the activities we did over the first few weeks in these two products. What have you been teaching? Lots of sorting, classifying, and counting? Love this post!!! Great ideas for beginning of the year math! 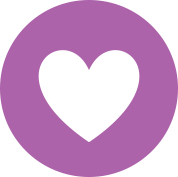 Thanks so much for linking up to our Great Blog Posts for Kinder Teachers!